This was a fantastic game. I know I’m very late on posting this write-up, but it’s been a hectic week and I haven’t had a lot of free time. This was a very fun game to watch and it involved a comeback in the fourth quarter after the Sun Devils took a 14 point lead with 14:23 left when Brock Osweiler ran for a 12 yard touchdown. James Franklin saved his best stuff for the 4th quarter as he delivered both of his touchdown strikes in the 4th. One was to L’Damian Washington with 12 minutes left in the quarter, and the final strike was to Michael Egnew with 2:50 remaining to tie the score. Brock Osweiler was the star of this game without question in my opinion, and really burst onto the scene as a prospect as far as I'm concerned. He's shot up my personal quarterback rankings this year, and I can't wait to watch him play the rest of the year. Brock Osweiler had a great game and he really impressed me. 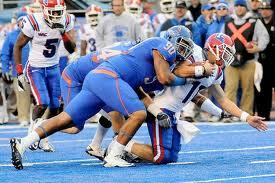 He has a fantastic combination of size (listed at 6’8”, 240 pounds) and arm strength. 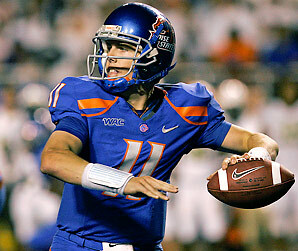 He’s got an extremely strong arm, perhaps comparable to Ryan Mallett’s. He has terrific zip on throws to all levels, a quality release (though it looks a little like a 3/4 release at times, I haven’t quite pinned down what it is, but it looks a little funny to me every now and then) and good mechanics when he throws the ball. He generates a lot of power when he plants and drives, but doesn’t always spin a clean ball when he releases it. More often than not I would say he does though. He also placed the ball very well in this game and displayed overall great accuracy as evidenced by his 24/32 performance for 353 yards (with an 11 yards per attempt average), three touchdowns and no interceptions. He even had 5 carries, 34 yards and one touchdown rushing despite not having great mobility. He didn’t display consistent poise in the pocket in this game, but he did flash the willingness to take a hit to deliver a throw. He left the pocket prematurely a few times in this game, so that is something to note. Overall I was very impressed with him as a prospect and if he continues to play well he will be one of my top junior quarterbacks behind Andrew Luck, Matt Barkley and Landry Jones. After four games (three against ranked teams- Missouri, Illinois and USC) he is 93/135 (68.9% completion), 1,094 yards, 8 TD’s and 3 INT’s. He also has 94 yards rushing and two touchdowns. Aaron Pflugrad had a breakout game of sorts against Missouri. He had two touchdowns in the opening game against UC Davis, but he had a huge game against Missouri when he totaled 8 catches, 180 yards (for a 22.5 ypc) and 2 TD’s. I had never seen him play before, but he was definitely the deep ball threat for Osweiler in this game and Missouri just couldn’t seem to keep him from getting behind their secondary. He’s only listed at 5’10”, 184 pounds but he was the playmaker in this game. He really stole the show. It’ll be interesting to see if he continues to be targeted by Osweiler the rest of the season, as after four games he has 22 receptions, 344 yards (15.64 yards per reception) and four touchdowns. Gerell Robinson had a solid game, but I am not very impressed with his hands. He had a couple drops in this game including one on a potential third down conversion. He has good size for a WR at 6’4”, 222 pounds and a listed 4.58 40 yard dash time. He produced two catches, 66 yards (33 ypc) and 0 TD’s despite a couple drops. He has solid upside as a possession receiver, but if he doesn’t make critical catches on third down it really limits his value as a prospect. Jamal Miles is a 5’10”, 180 pound WR who does it all for Missouri. 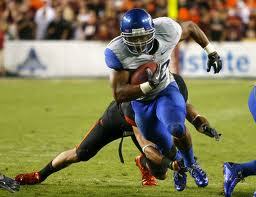 In this game he had two carries for 13 yards, six catches for 50 yards and 2 TD’s, and three punt returns for 27 yards. This year he has 16 receptions, 110 yards and three touchdowns receiving. He also has six rushes for 53 yards, five kickoff returns for 169 yards (and one TD), and seven punt returns for 87 yards. He even has a touchdown pass this year (1 pass attempt completed for 35 yards). 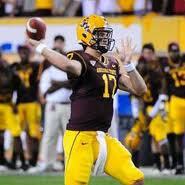 He even scored the winning touchdown on a swing pass from Brock Osweiler in OT to put the Sun Devils ahead for good. He had a good game even if he had a couple incidents returning punts. He’s very versatile, so it’ll be interesting if he continues to prove his value in so many different phases of the game. Junior Onyeali is a dynamic, albiet undersized, defensive end. He's underrated because of his size, but he has the potential to be extremely disruptive as he continues to develop. Junior Onyeali is a very undersized DE on Arizona State. He’s listed at 5’11”, 244 pounds which is very small for a defensive end, but I couldn’t help but be impressed by his burst off the ball and his speed off the edge. I was impressed with him as a freshman and he flashed the same ability as a sophomore against Missouri. He hasn’t been producing at the same level statistically, but he was able to create relatively consistent pressure against Missouri. He definitely has upside even if he’s undersized. 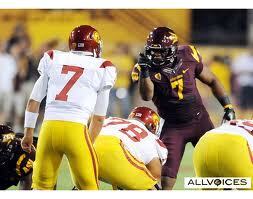 Jamaar Jarrett is a senior defensive end on Arizona State. He’s listed at 6’5”, 260 pounds and while his production has been more limited as a senior he had 40 total tackles (23 solo), 10.5 TFL and 4.5 sacks as a junior. He doesn’t have a lot of burst off the ball or off the edge if I remember, but he is pretty solid against the run. It’ll be interesting to see how he does in the remainder of the games I watch of him. Vontaze Burfict is one of the top linebacker prospects in the country because of his great combination of size and athletic ability. He’s listed at 6’3”, 250 pounds and has a listed 40 yard dash time of 4.67. He packs a serious punch as a hitter and is an effective blitzer, and plays with a lot of aggressiveness as a football player. The problem is, sometimes that aggression spills over on and off the field (such as when he punched one of his teammates in the locker room, or when he draws unnecessary late hit penalties). I’m not sold on his instincts and ability to read and react to plays yet, nor am I confident in his ability in coverage. However, he does play the run well and he is very effective when he can flow to the ball, play downhill or attack blockers. He’s strong and aggressive enough to be a very effective linebacker. Burfict is an intimidating presence at the heart of Arizona State's defense, but I don't know how good his instincts are, how effective he is in coverage, and he has a tendency to draw unnecessary penalties. Shelly Lyons is an outside linebacker on Arizona State who’s relatively undersized for a linebacker even though he is 6’2”, but he only weighs 228 pounds. He’s got ability and he’s a good tackler, and he seems to flow to the ball well. I’m not sold on his ability to shed blocks, but he gets pretty good depth in his drops and seems comfortable in coverage. He actually recorded an interception and returned it for a touchdown this past weekend against USC. He’s an under the radar senior in my opinion, so it’ll be interesting to see how he progresses this year. I’m not sure how good of a game he had because it’s hard to watch the secondary due to ESPN’s camera angles, but Eddie Elder is a safety on Arizona State that had a productive season last year despite only being 5’10”. He’s another under the radar guy to keep an eye on, though he’s had a relatively slow start to the season statistically. James Franklin is the sophomore quarterback on Missouri that has stepped up to replace Blaine Gabbert. He isn’t a very good passer, but he had a productive game completing 26/42 pass attempts, throwing for 319 yards (with a 7.6 YPA), plus 2 TD’s and no interceptions. He also had 27 carries, 84 yards (3.1 ypa) and 1 TD on the ground. He led Missouri in rushing attempts against Arizona State, and he seems to have a pretty strong arm, but I wasn’t impressed with his mechanics or his pocket poise. I don’t think he has a ton of upside as a passing quarterback (like a number of past Missouri quarterbacks excluding Gabbert) but he can still be an effective college starter for them due to his arm strength and his ability to gain yardage on the ground. Shelly Lyons is an underrated linebacker, but I was impressed with him when I watched him last year and he continues to flash ability as a senior. Keep an eye on him. Henry Josey is Missouri’s very athletic running back. He’s listed at 5’10”, 190 pounds but he’s got a lot of speed to make plays in open space. He had very limited touches in this game as he only had nine carries and two catches, but produced 94 yards rushing (a 10.4 ypc average) and 51 yards receiving. In four games he has produced more yards rushing than his freshman year (533 yards versus 437) and is averaging an absurd 12.4 yards per carry. He also has four touchdowns after producing five as a freshman. He also has five receptions, 65 yards versus only four receptions for 19 yards a year ago. I really like him as a potential 3rd down back and he’s used as the complement to James Franklin who generally gets far more carries. Marcus Lucas, a sophomore receiver on Missouri, intrigues me because of his size (6’5”, 205 lbs) and because he had a pretty big game against Arizona State’s secondary. He had 5 receptions, 97 yards, and one touchdown in the game, and his receptions were critical ones for a touchdown or some big first down conversions. He’s definitely a guy to keep an eye on since Missouri likes to spread the ball around and he’s a great red zone threat for them. T.J. Moe is a smaller, squattier looking receiver who is listed at 5’11”, 195 pounds. He might not be the tallest, the fastest or the quickest, but he’s got great hands and he rarely drops anything. He looks like a running back running routes and I’m not sure he is going to be able to create consistent separation in the NFL, but if you’ve got hands like he does you can find a way to stick in the NFL somehow. He’s tough too so while he is probably a 4th round grade this year he could definitely have a shot at getting drafted in the 2013 draft after he graduates. He had 92 receptions, 1,045 yards and 6 TD’s last year and was one of Gabbert’s more reliable targets as a sophomore. He probably won’t replicate those numbers this year, but that won’t change the fact that he’s got great hands. L’Damian Washington hasn’t gotten a ton of looks this year but he has good size (6’4”, 185 pounds) and has been good for vertical plays despite only having eight catches on the season. He has produced 149 yards (18.63 yard per catch average) and two touchdowns on those catches, including a big score against Arizona State. He’s only a sophomore, but he’s got good size and has flashed good hands. Missouri is deep at receiver this year but it will be fun to see Washington and Lucas step up as they move up the depth chart. They’ve got a lot of potential and they’ll be developing right along with James Franklin since they are all sophomores. Michael Egnew is without a doubt the best senior tight end in my opinion, and he and Orson Charles of Georgia are 1 and 1a in this potential 2012 Draft class. Michael Egnew is one of the best TE prospects in the draft despite limited targets this year he continues to prove it. He’s a great red-zone threat thanks to his 6’6”, 245 pound frame and he’s got very good hands. He’s not the best blocker, but he is developing a bit in this area. But he’s athletic enough to be split out like a super-sized receiver, and he can create enough separation to attack the seam. As his blocking continues to improve he will become a more and more complete tight end, but he is definitely one of the best draft-eligible tight ends in the draft along with Orson Charles from Georgia. Jacquies Smith was the DE playing opposite Aldon Smith last year, and he had a good year producing 35 tackles, 10 TFL, 5.5 sacks, one fumble recovery, three pass deflections, two forced fumbles and one blocked kick/punt. He has good size (6’4”, 250) and has shown speed off the edge, but he just hasn’t produced at the same level without Smith opposite him. He’s only been healthy for two of their four games this year, but he has to pick it up if he’s going to prove that his good season last year wasn’t just a product of teams ignoring him to try to deal with Smith. Sorry this post took me so long to get done, but there were a lot of things to touch on and I haven’t had much time. It feels good to have it done, and hopefully you enjoyed reading it.